The Luma Building on Shieldhall rd always intrigued me comming along the Motorway with its tower all lit up at certain times of the year, did anyone ever work there when it was the Luma lamp factory? I can remember going past it on the motorway when I was young and seeing the caravans in the towers... then one day I noticed it was empty and looking rather sorry for itself. I can remember going past it in the car as a boy and seeing the tower lit up in blue and green. For years I used to think it was something to do with Renfrew Airport, which was just along the road. A lot of people used to think it had something to do with Renfrew Airport because of course it does have a sort of 1930's aerodrome look about it, complete with air traffic control tower. In fact it was built and operated by the Scottish Co-Operative Wholesale Society [SCWS] who at one time had a huge industrial estate in that part of Shieldhall. I've always been interested to know whether the tower actually performed some sort of a function in relation to the manufacture of lightbulbs [display maybe?] or whether it was just part of the design. Wasn't that building called "Caravan Land" at one time? Any pics of that? I was brought up along the road from the Luma lamp factory. I understand the "gimmick" of the tower was that there was lightbulbs on test in the tower as a way of advertising the product. I remember seeing a outsize lightbulb in the tower when i was very young but i do not recall if it lit up or when the lightbulb factory actually closed. When i was about 10 or 11 i had an unofficial Saturday job in Caravan Land helping the older local boys to wash the used Caravans which were in the forecourt. Caravan Land had a camping / outdoor store on one of the upper floors. What the owners did not know was that they were getting robbed blind by the local lads who worked in the Camping store. They would open a vent grille on the first floor and launch tents and rucksacks etc down the duct to their pals who would be waiting at the rear of the building at the bottom of the duct. I would point out that i was not involved in such practices. "Caravan Land" was also an early Deacon Blue song, inspired by the building. I too, incidentally, was fed parental misinformation about the building, being led to believe it was the control tower for an airport that wasnt there any more as they built the motorway over the runway. My aunt worked in the Luma light Factory in the forties, she was also in the documentary a few years ago about the factory and it's workers. It was a good place to work by all accounts, the conditions were first meant to be rate. Couple of links, one regarding the prior use of the building and its restoration http://www.ihbc.org.uk/context_archive/ ... tower.html and another with a pic of the interior glass block stair, which I hadn't heard about before. Hey dont apologise for the size, if theres one thing I hate is photos too small to be worth downloading! 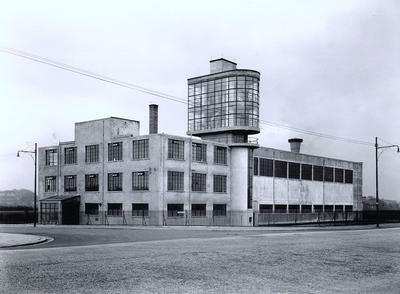 Another art deco building in this vicinity was the India Tyre Factory in Inchinnan, thought i'd post up here rather than start a new thread. The main entrance to the amazing art deco style India Tyre factory at Inchinnan.. This catogory A listed building dates from the early 1930's, when India Tyres closed the building lay derelect for many years but was restored in 2001 and is now a hi-tech business centre.